Tópicos: Reservations, Ruth's Attic Bookstore, e Graham Brothers Dairy Bar. 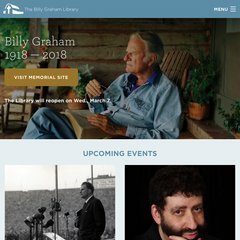 billygrahamlibrary.org Billy Graham Library: Christmas at the Library (Note New Hours For ..
billygrahamlibrary.org Billy Graham Evangelistic Association The Billy Graham Library ..
ASP.NET é o seu ambiente de programação. Os 2 nameservers são ns02.bgea.org, e ns01.bgea.org. Está hospedado em Alltel - Dedicated Customer Arkansas, utilizando um servidor Microsoft-IIS/6.